2012 will not be a bumper year for cider makers. 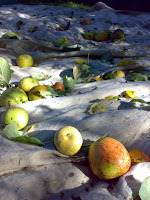 All that cold and rain early in the season following on from a winter drought has given us an awful yield. So in our mixed orchard, which trees were the winners and which the losers? In the non-cider space, my mother is vexed by the failure of her cooking apples. Not a single Bramley this year from five trees, that's something of a disaster for me as well as for her because I normally use Bramleys as the bulk of my drinking juice production. But as always with a mixed orchard there is another tree that takes the strain. 2012 was a good year for Grenadiers, the early cooker, so our freezer is full of both sliced apple and plastic cartons of pasteurised September juice. My cider comes mostly from dessert apples. 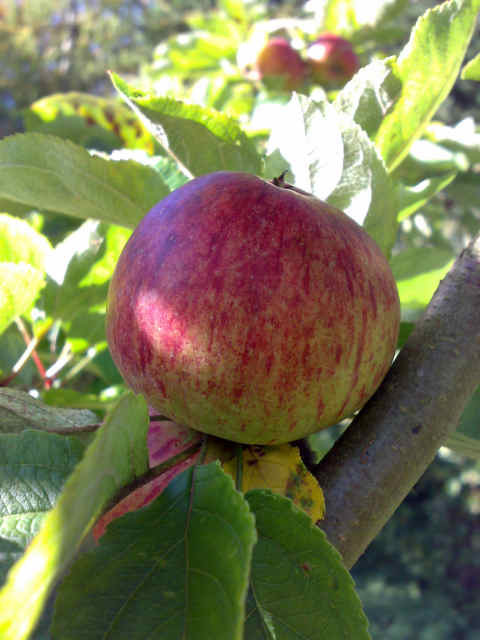 There are one or two trees that normally produce unspectacular apples in huge quantities, Wagoner, Sturmer Pippin and Rosemary Russet, that give me a decent base of juice that I can blend with sweeter apples and my relatively few Dabinetts. This year though only the Wagoner made the grade, and an ancient Cox sport planted as a pip in the 1940s that is two stories high. I had no chance this year of the trees from which I normally get the small and misshapen fruit, the Ingrid Maries and the Crispins. Oddly my Dabinett has done very well this year, but it's still too young to contribute a significant amount. So in the end I have about half the cider from 2012 that I'd expect. I have plenty from previous years and 2012 will still provide me with enough for my needs, but I can't rate this year as a good one. There is a silver lining though. The trees are healthy, and after a few bumper years the rest will do them no harm. With luck 2013 will be a better year still for that.